For similarly named units, see Yorkshire South (disambiguation). Lying on the east side of the Pennines, South Yorkshire is landlocked, and borders Derbyshire to the west and south-west, West Yorkshire to the north-west, North Yorkshire to the north, the East Riding of Yorkshire to the north-east, Lincolnshire to the east and Nottinghamshire to the south-east. The Sheffield Urban Area is the tenth most populous conurbation in the UK, and dominates the western half of South Yorkshire with over half of the county's population living within it. South Yorkshire lies within the Sheffield City Region with Barnsley also being within the Leeds City Region, reflecting its geographical position midway between Yorkshire's two largest cities. South Yorkshire County Council was abolished in 1986 and its metropolitan boroughs are now effectively unitary authorities, although the metropolitan county continues to exist in law. As a ceremonial county, South Yorkshire has a Lord Lieutenant and a High Sheriff. 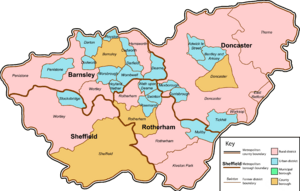 South Yorkshire was created from 32 local government districts of the West Riding of Yorkshire (the administrative county and four independent county boroughs), with small areas from Derbyshire and Nottinghamshire. Although the modern county of South Yorkshire was not created until 1974, the history of its constituent settlements and parts goes back centuries. Prehistoric remains include a Mesolithic "house" (a circle of stones in the shape of a hut-base) dating to around 8000 BC, found at Deepcar, in the northern part of Sheffield. Evidence of even earlier inhabitation in the wider region exists about 3 miles (4.8 km)* over the county boundary at Creswell Crags in Derbyshire, where artefacts and rock art found in caves have been dated by archaeologists to the late Upper Palaeolithic period, at least 12,800 years ago. The region was on the frontier of the Roman Empire during the Roman period. The main settlements of South Yorkshire grew up around the industries of mining and steel manufacturing. The main mining industry was coal which was concentrated to the north and east of the county. There were also iron deposits which were mined in the area. The rivers running off the Pennines to the west of the county supported the steel industry that is concentrated in the city of Sheffield. The proximity of the iron and coal also made this an ideal place for steel manufacture. Although Christian nonconformism was never as strong in South Yorkshire as in the mill towns of West Yorkshire, there are still many Methodist and Baptist churches in the area. Also, South Yorkshire has a relatively high number of followers of spiritualism. It is the only county that counts as a full region in the Spiritualists' National Union. The Local Government Commission for England presented draft recommendations, in December 1965, proposing a new county—York and North Midlands—roughly centred on the southern part of the West Riding of Yorkshire and northern parts of Derbyshire and Nottinghamshire. The review was abolished in favour of the Royal Commission on Local Government before it was able to issue a final report. The Royal Commission's 1969 report, known as the Redcliffe-Maud Report, proposed the removal of much of the then existing system of local government. The commission described the system of administering urban and rural districts separately as outdated, noting that urban areas provided employment and services for rural dwellers, and open countryside was used by town dwellers for recreation. Redcliffe-Maud's recommendations were accepted by the Labour government in February 1970. Although the Redcliffe-Maud Report was rejected by the Conservative government after the 1970 general election, there was a commitment to local government reform, and the need for a metropolitan county of South Yorkshire. The Local Government Act 1972 reformed local government in England by creating a system of two-tier metropolitan and non-metropolitan counties and districts throughout the country. 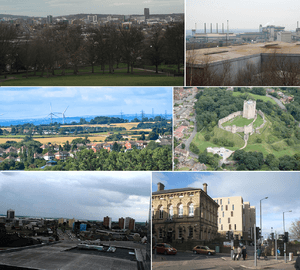 The act formally established South Yorkshire on 1 April 1974, although South Yorkshire County Council (SYCC) had been running since elections in 1973. The leading article in The Times on the day the Local Government Act came into effect noted that the "new arrangement is a compromise which seeks to reconcile familiar geography which commands a certain amount of affection and loyalty, with the scale of operations on which modern planning methods can work effectively". South Yorkshire initially had a two tier structure of local government with a strategic-level county council and four districts providing most services. In 1974, as part of the South Yorkshire Structure Plan of the environment, conservation and land use, South Yorkshire County Council commissioned a public attitudes survey covering job opportunities, educational facilities, leisure opportunities, health and medical services, shopping centres and transport in the county. In 1986, throughout England the metropolitan county councils were abolished. The functions of the county council were devolved to the boroughs; joint-boards covering fire, police and public transport; and to other special joint arrangements. The joint boards continue to function and include the South Yorkshire Passenger Transport Executive. The South Yorkshire Police and Crime Commissioner also oversees South Yorkshire Police. Although the county council was abolished, South Yorkshire remains a metropolitan and ceremonial county with a Lord Lieutenant of South Yorkshire and a High Sheriff. The county borders Derbyshire, West Yorkshire, North Yorkshire, the East Riding of Yorkshire, Lincolnshire and Nottinghamshire. The metropolitan county lies largely on the carboniferous rocks of the Yorkshire coalfield which have produced a rolling landscape with hills, escarpments and broad valleys. In this landscape there is widespread evidence of both current and former industrial activity. There are numerous mine buildings, former spoil heaps and iron and steel plants. The scenery is a mixture of built up areas, industrial land with some dereliction, and farmed open country. Ribbon developments along transport routes including canal, road and rail are prominent features of the area although some remnants of the pre industrial landscape and semi-natural vegetation still survive. The west of the county is fringed by the Pennines and its foothills, most of which lie inside the Peak District National Park and also contain carboniferous rocks, with the underlying geology primarily being millstone grit sandstones rising from the Yorkshire coalfield. The Pennine range within the county is distinguished by the moorlands and plateaus of the Dark Peak while the Pennine fringes are distinguished by many steep valleys, and a transition from uplands and rural landscape to lowlands and urban landscape towards the east of the county. Major rivers which cross the area are the Dearne, Rother and Don. To the east, in the Doncaster area the landscape becomes flatter as the eastward dipping carboniferous rocks of the coalfield are overlain by the lacustrine deposits of the Humberhead Levels. There is very little evidence of glaciation in the area as it lies largely beyond the limit of the last glaciation. 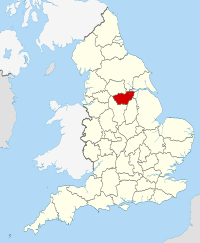 Of these settlements above, South Yorkshire has three main urban areas: the Dearne Valley which covers Barnsley and surrounding area; the Sheffield urban area which covers Sheffield, Rotherham and surrounding area; and the Doncaster urban area which covers Doncaster and surrounding area. The coat of arms of the former South Yorkshire County Council. South Yorkshire Facts for Kids. Kiddle Encyclopedia.